Little job competition: Those searching for jobs in July faced the least amount of competition since the BLS started tracking the data in December 2000. The ratio of unemployed people for every open job—including those who are employed part-time because they cannot get full-time work and those who are marginally attached to the labor force—dropped to 1.8 in July compared to 2.2 the prior year and a high of 11.74 in July 2009. Using the headline unemployment figure, which does not include discouraged workers (those who gave up hopes of finding a job and stopped looking), there were 0.9 unemployed individuals for every available job in July compared to 1.1 the previous year and a high of 6.7 in July 2009. High worker confidence: Our “Take this job and shove it” indicator, or quits to total separations, increased to a record high of 64.7% compared to 59.9% the prior year and a low of 37.3% in April 2009. The number of people voluntarily quitting their jobs jumped by 106,000 to 3.58 million in July, up 10.6% y/y. That’s a new record back to December 2000 but one that could grow from here given the larger workforce. By contrast, employers are trying to retain workers. Layoffs and discharges fell by 11.8% y/y to 1.6 million in July, nearing record low levels. Healthy hiring appetite: Job openings rose by 117,000 to 6.94 million in July, up 11.9% y/y. That marks a new record, which again can climb higher given a larger US labor market relative to when the data series first started. It is a notable figure, however, as it shows strong conviction in the economy and employers’ ability/desire to grow their businesses. Employers are also hiring at record levels, with the number of people starting new jobs up 3.1% y/y to 5.68 million this past July. 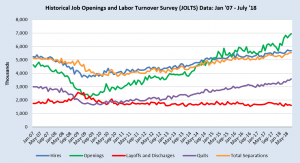 While a robust figure, it still lags the number of job openings by 1.26 million. That’s a troubling spread, as hires always exceeded job openings prior to August 2014 and shows the mismatch between workers’ skills/education level and employers’ requirements. Another stat that highlights this disparity is that there were 659,000 more job openings than unemployed workers in July; there’s been more jobs available than unemployed persons for five straight months. In sum, the US labor market is very tight as workers are more confident than ever in their skills to get a better paying position. This in combination with little competition from others trying to get the same job helps spur wage growth as workers have more negotiating power. That said, although employers are also posting new jobs at record levels, their hiring is not keeping pace. To the degree to which this is caused by a skills gap, these companies either need to lower their educational requirements or introduce new training programs. Even still, we should continue to see wages pickup more meaningfully.